It fits six people at one time! First came unicorns and flamingos, then Sam’s Club dropped even more giant pool floats this year with the addition of a speed boat and a swan. Obviously, at 9 feet fall and with an inflatable bench, cupholders and room for six friends, the floats are seriously popular. 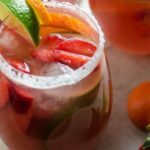 But if you haven’t decided which one to get for this summer’s beach days yet, there’s yet another float that’s going to make the decision even harder. This one comes from Funboy, is 7 feet tall and has recessed seating for six adults. Appropriately called Giant Rainbow Cloud Island, it has six cupholders, a built-in cooler and a water pad entry. 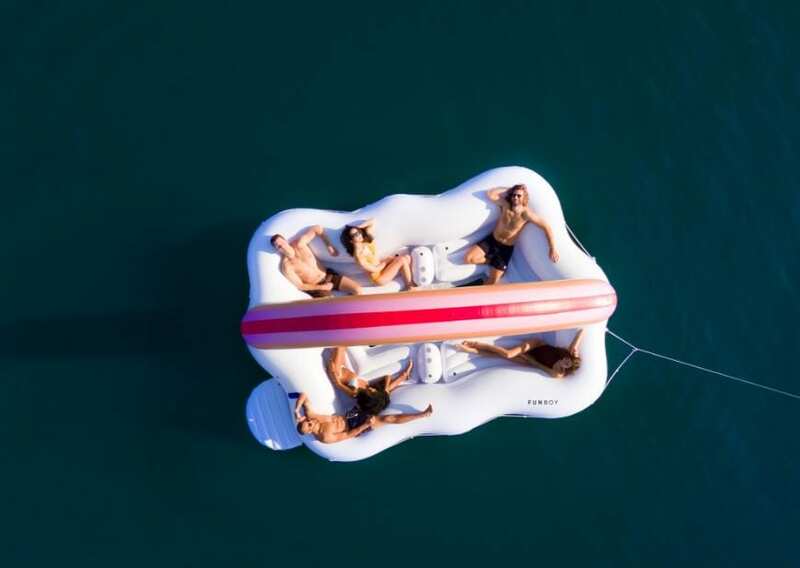 Other features include a reinforced mesh base that provides a cooling foot bath on hot summer days and a mesh carrying bag so you can easily transport your float to your destination and then blow it up with the included pump once you’re near the water. The float is made from environmentally friendly materials and Funboy says commercial grade construction techniques were used. Each float even endures a 24-hour air test and the materials pass strict third-party lab tests before being certified for sale. 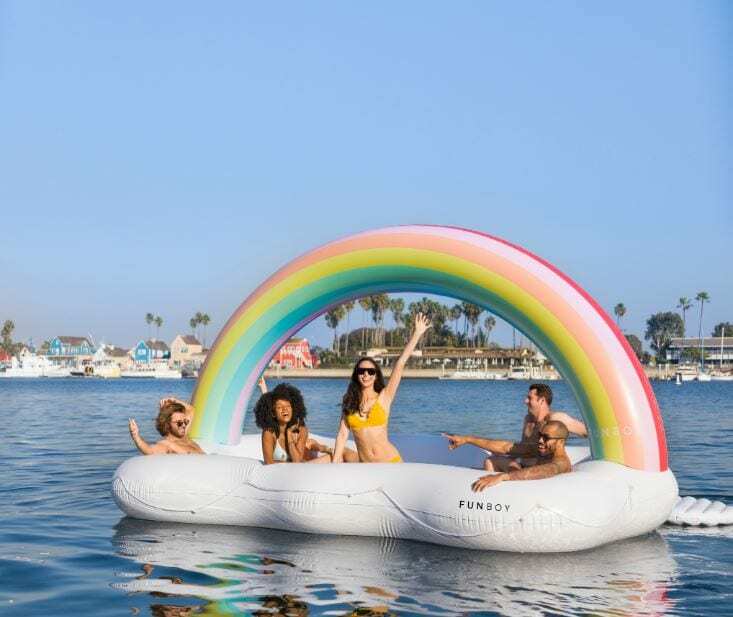 “We wanted to create the largest, most luxurious, aesthetically pleasing, highest-quality, island float ever,” Celeste Barrett, creative director and co-founder of Funboy, said in a statement. The Giant Rainbow Cloud Island costs more than double the $17o floats at Sam’s Club, coming in at $369. 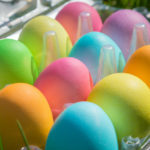 But if rainbows are your thing, it looks totally worth it. Plus, if you split the cost with six friends, that comes out to only $61.50 each. Shipping is free starting March 29. If the price tag is a bit steep for you, the rainbow cloud island is actually a followup to a smaller float — the Rainbow Cloud Daybed. This float is $139, but only has 50 square feet of lounging space. 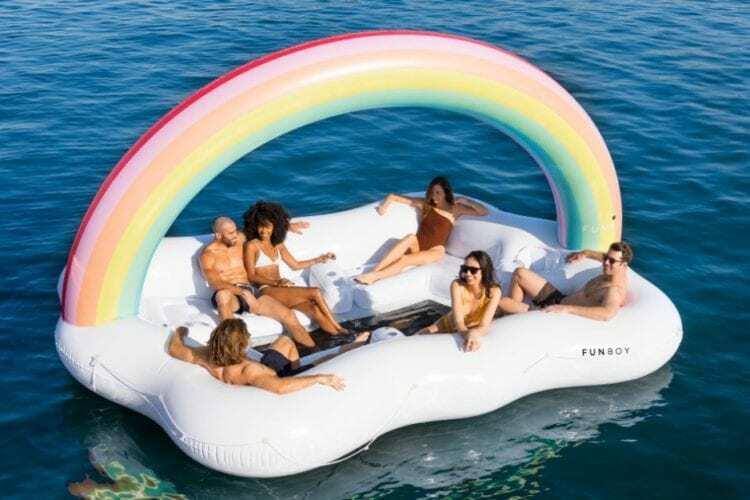 You can order the Giant Rainbow Cloud Island or see all of Funboy’s other floats by visiting their website. 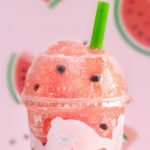 Will you be purchasing a giant float for your summer adventures?